When you are traveling with children, the thought of taking them to an art museum can seem really daunting. Unpredictable, energetic, tiny humans with busy hands in a building full of expensive masterpieces, sounds scary. So why risk it? Why expose them to it, especially at a young age? Why does art even matter anyways? One movie really put this in perspective for me, The Monuments Men. The re-account of this true story helped me realize why I do think art is so important for my kids and why I want them to grow up being exposed to it and appreciate it. I first watched this movie on a plane heading back to the United States after a month in Europe. I watched it again last night and was still moved to tears. For those that don’t know the movie, it tells the story of a small unit in the Allied armed forces during WWII made up of art curators and professors whose job it was to try to find and reclaim precious works of art stolen by the Nazi government from private homes and museums across Europe. In the midst of all of the violence of the war and the heartbreaking fact that millions of Jews were being killed, tortured and imprison, it was a difficult task to convince the powers that be that it was important work and worth the resources needed to save art. Why should we care so much about paintings, sculptures or architectural wonders? The movie’s goal was to answer that question. They wanted to save “The greatest historical achievements of man.” ~A quote by George Clooney’s character Frank Stokkes (George Stouts in real life). Many of the classical masterpieces of art are in fact some of man’s greatest achievements, especially when you think of how “advanced” our technological world is today verses the time period in which most of these works were completed. But if you look at it a level deeper, you get to the root answer. Art matters because it mattered to people. It influenced society. Art has inspired hope, it has taught us about our past and it shows the perseverance of man. When I look at a painting, I imagine how many millions of people have looked at the same painting for centuries. I wonder what they thought of it. If it reminds them of summer time with their grandparents too? Or why women today who are plump and curvy are not immortalized in photographs like the women in paintings from the past several centuries. There is that saying “A picture is worth a thousand words.” You can read about the history of the world, but seeing it, gives you an actual glimpse into the past. Now, of course I have no delusions to the fact that historical art was mostly commissioned to present a specific appearance that wasn’t always a true reflection of the reality of, say, the person who commissioned the portrait. But you still learn something from it, the fact that people have always held the desire to have their image captured, to be remembered, much like we love to have pictures taken of our family today. We as people want to be remembered, that hasn’t changed for thousands of years! Art shows us the connections we have as a human race. Art exists across all cultures. All of the great societies over time cared about, supported, and funded art. That is why it is important for me to expose my children to art. If humanity is connected by way of us all having a desire to be remembered, what other emotional similarities do we share? It makes us ask what emotions or message was the artist trying to share? When we can connect with something on an emotional level, we all of the sudden have more respect, more value for that society, those peoples, and in turn, the people today. I can look at a painting and imagine what the people in the scene did next. How else did they spend the rest of their day? Their life? I want my kids to be able to look at something and imagine those life stories too. 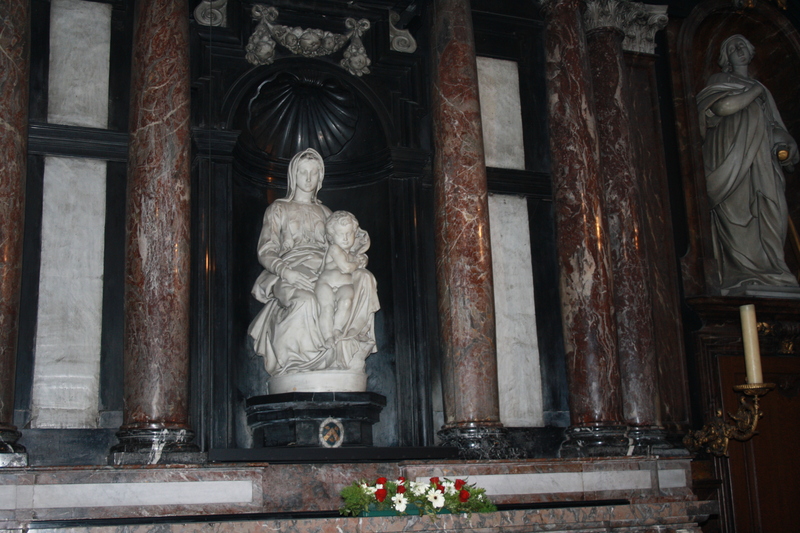 And as they get older, I hope they can look at a sculpture like Michelangelo’s Madonna and Child in Bruges and understand how it gave hope to millions of people through suffering and despair. How alter pieces and religious frescos in cathedrals allowed common illiterate people to feel a connection to their God and be reminded of stories that they were in capable to read in a book. I want them to understand the motivation and emotions the artist had behind creating the piece of art and how it affected the audiences that first viewed it. Thousands of years of history of the human struggle, life, culture, feelings. Who we are, who they were and why we are who we are today can all be told through art. The preservation of this is exceedingly important. This is what I hope to teach my children. Sure it would be nice if they could spout off the elements that separate impressionists from classical master techniques, and perhaps it would be impressive if when they get to high school they can remember in their art history class that they once saw several Picassos in a museum in Malaga, Spain. But most of all, I want them to be inspired by the beauty that humans can create. To appreciate the motivations behind an artist’s work. To think about what feelings the artist must have had and to realize that behind every image they see, from the works in the Louvre to a picture on Facebook, that a real human being with feelings and emotions is standing right behind it. ART HAS INSPIRED EMOTIONS IN MILLIONS OF PEOPLE, FROM DIFFERENT BACKGROUNDS FOR THOUSANDS OF YEARS. ALL PEOPLE HAVE FEELINGS, REGARDLESS OF RACE OR GENDER. WE ALL POSSESS THE ABILITY TO BE MOVED AND THE DESIRE TO MOVE OTHERS. THE FACT THAT A SINGLE PIECE OF ART CAN AROUSE DIFFERENT EMOTIONS IN THE SAME PEOPLE OR THE SAME EMOTION IN DIFFERENT PEOPLE OVER MULTIPLE GENERATIONS SPEAKS TO ITS IMPORTANCE. ← Brussels, Belgium. Home of the Waffle, Fries and One of Europe’s Most Beautiful Town Squares!